In my post on snagging free and deeply discounted food, I listed a meal swap (or meal sharing) as a way to save money on food. Here’s how to set one up. 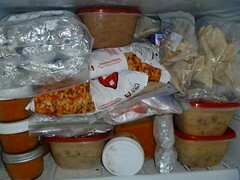 The idea behind a meal swap is that each person makes a big batch of what they are cooking and then divides it into smaller servings, packing the food so it is freezer ready. Everyone in the meal swap meets once a week or once a month (whatever is decided upon) and swaps what they have made. takes one of whatever each other makes. In most swaps, you don’t have to swap unless you want to. This is more like communal cooking and sharing. The savings in this system is not only the cost of the ingredients, but also the amount of time involved in cooking. There are stumbling blocks to making this work, so I want to address those here. I have never done a meal swap, but it is a great way to save money and time. Get a group of people committed to doing this. If you have seven families in the group and two of them aren’t dedicated, then you end up with only five dishes. It won’t be enough to keep it going. Check for allergies. If one person is allergic to soy and another to peanuts and another to dairy and another to gluten it will be hard to make this work. There will be so many restrictions! On the other hand, if you gather together a group with similar allergies, it would be VERY helpful. Decide on standards for ingredients. Do you only want organic veggies or will regular veggies do? Free range eggs only, or will commercial eggs be okay? Agree about the portions and cost. Will it be fair for one person to bring in a huge container of soup and another person to bring a jar of jam? How do you maintain balance? I suggest everyone make an entree. (Check out our recipes page for ideas). You might add a side dish if everything goes well. Decide upon a convenient time and place to meet and swap. Ideally, members either live nearby or have a common meeting place like work or church. This will make it easier to keep your swap going. Reuse storage containers so Tupperware is not an additional cost. Consider a liability waiver for each participant to sign indicating that everyone promises to uphold to the highest level of cleanliness and take responsibility for swapping. In other words, no one can sue if they get sick from eating what you make. So… make sure that everyone is knowledgeable about how to handle the cooking and storing of food. You might even consider, as a group, taking . Have you swapped meals? I’d like to hear how it went for you. 12 freebies, Jamba Juice coupon, and more!